Have you read Judge Judy‘s “Beauty Fades, Dumb is Forever: The Making of a Happy Woman?” Don’t judge me. Summer is the time for light reading. In any case, there were parts of the book that made sense, other parts that seemed biased to Judge Judy’s default position that she was programmed into by her parents. She may be just a touch too sure of herself. Ya think? If I have to think of my default position, I think of lasagna. 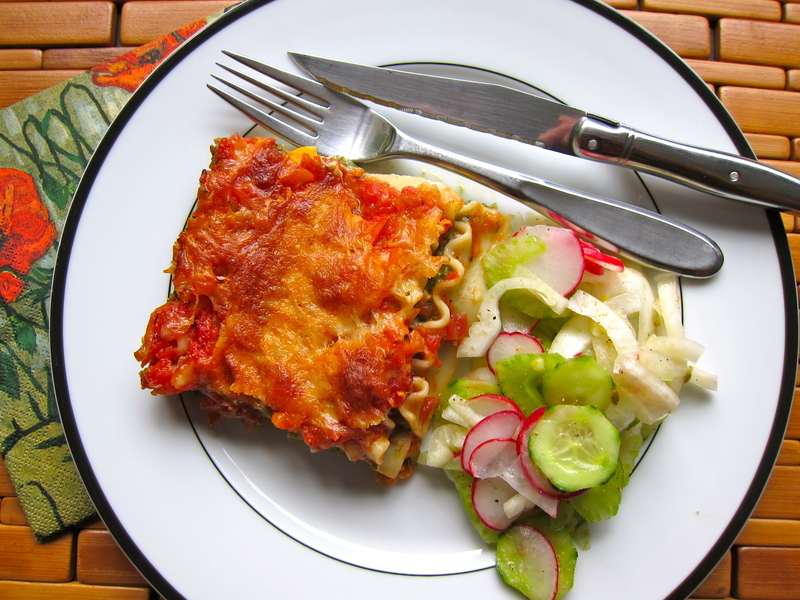 Well-made lasagna is go-to comfort food. So, here we go. When my dear friend, Sheryl Shuchat, suggested this recipe, I looked it over quickly and decided to pass. Then I tasted it at a pot luck dinner party and immediately demanded the recipe. Mix the spinach, cheese, scallion and seasonings. Heat the olive oil on medium high heat in a large skillet. Cook the onion for a minute, then add the tomatoes, bell peppers, sugar and seasonings. Bring to a boil, then simmer for 5 minutes. Grease a lasagna pan. Lay down 3 noodles. Cover with half the spinach mixture. Lay down 3 more noodles. Cover with the remainder of the spinach mixture. Lay down the last 3 noodles. 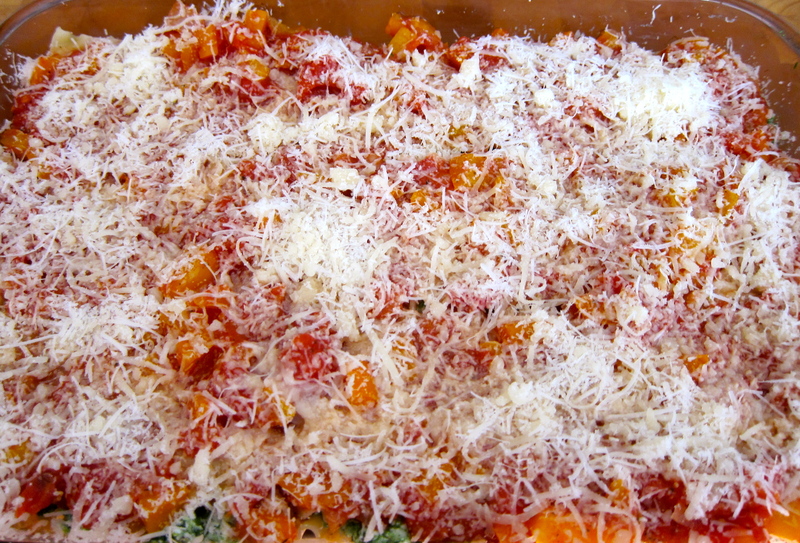 Cover with the tomato sauce. Sprinkle on the extra parmesan and mozzarella. Cook at 350F for 45 minutes or until cooked through. Serve with salad or cold roasted vegetables. Go back one recipe2recipe post to see the photos of Shrimp DeJonghe along with some recipe tweaks. This recipe is adapted from “With Love from Darling’s Kitchen“, by Renny Darling. The Turkey Farmers of Canada have selected Jittery Cook to take part in the Great Grilling Turkey Trial featuring a barbeque turkey recipe. 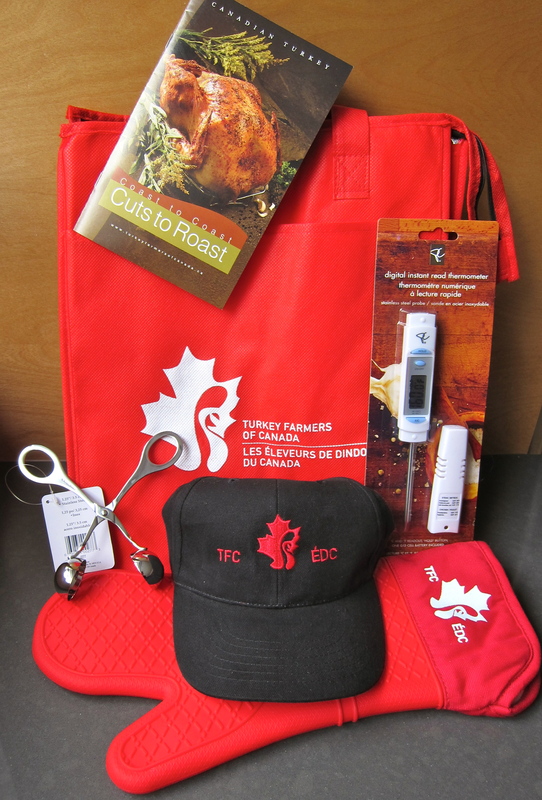 As a perk, I will get my very own BBQ prize pack. And lucky you, I’m giving another one of them to you. To win, simply email me (hollybotner@gmail.com) your favorite recipes to share on jitterycook.com and recipe2recipe.com.